"Smartphones are becoming more and more common in rural Africa," explained James Legg of the International Institute of Tropical Agriculture (IITA), who leads the project with David Hughes, associate professor of entomology and biology, Penn State. 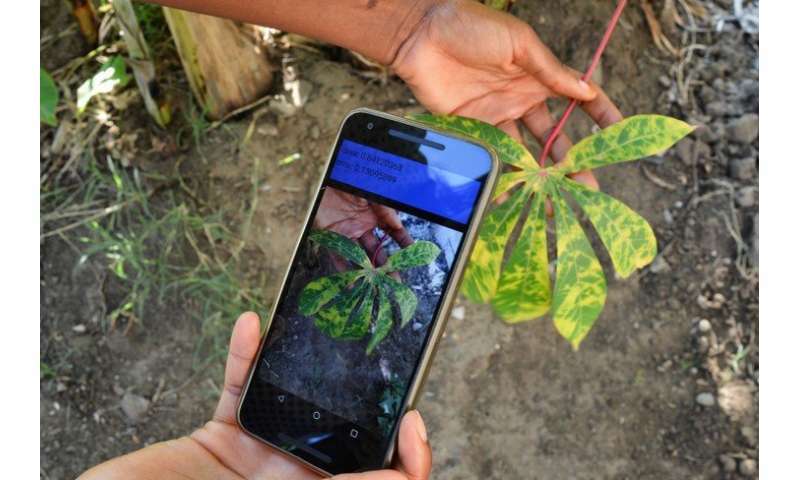 "Smallholders or extension officers with a basic smartphone with a camera will be able to download the app for free, fire it up, point it at a leaf with disease symptoms and get an instant diagnosis. That is truly revolutionary!" The team's $100,000 grant is part of the CGIAR Platform for Big Data in Agriculture "Inspire Challenges" program. The award was announced Sept. 21 at the Big Data in Agriculture Convention 2017 in Cali, Colombia. "This prize is transformative. It allows us to expand across multiple sites in Africa and multiple crops that are critical for food security on the continent," said Penn State's Hughes, who has appointments in the College of Agricultural Sciences and the Eberly College of Science. "We can amplify by 100 times what we have achieved so far." "The app employs AI in real time so the farmer can be an active participant in disease diagnosis and crop health management, leading to more yields for smallholder farmers," Hughes said. "It also is revolutionary because our artificial intelligence is based on the world's best human intelligence on African crops—the research scientists at CGIAR and RTB."